Aim: To evaluate shear bond strength of silorane and bis-GMA based composite resins using self-etch and total-etch adhesive systems, and compare the effect of Quartz-tungten-halogen (QTH) and Light emitting diode (LED) on the shear bond strength of the experimental materials. Materials and Methods: Flat dentin surfaces were exposed on intact extracted molars and composite resin was built 2 mm in diameter. Teeth were divided randomly into four groups. Groups 1 and 2 were restored with P90 system adhesive and Filtek P90 and cured with QTH and LED units respectively. Groups 3 and 4 were restored with total etch adhesive and Filtek Z100 and cured with QTH and LED units respectively. Specimens were subjected to shear bond strength testing using Instrom Universal testing machine. Results: Data was subjected to one-way analysis of variance. Total-etch groups gave significantly higher shear bond strength values than the self-etch groups. No significant difference in shear bond strength was found between Groups 3 and 4, while Group 1 showed significantly higher values than Group 2. Conclusion: Type of light curing unit is not a significant factor affecting shear bond strength for bis-GMA RBCs using total-etch technique; while for curing silorane resin based composite (RBCs), conventional halogen curing units showed better results. Commercially silorane-based RBC is available as Filtek P90 (3M ESPE). It is a microhybrid composite, filled with fine quartz particles, and radio-opaque yttrium fluoride. Filtek P90 is used along with P90 system adhesive, a two step self-etching bonding system. It consists of a P90 system adhesive self-etch primer which is hydrophilic and bonds to the tooth, and a P90 system adhesive bond which is hydrophobic and adheres to the resin. Thus, this study was conducted to evaluate shear bond strength of silorane and bis-GMA based composite resins using total-etch and self-etch adhesive systems, and also to compare the effect of QTH and LED on the shear bond strength of the experimental materials. Eighty freshly extracted human molars (forty eight mandibular and thirty two maxillary) were collected and stored in distilled water until use. Routine prophylactic procedure was carried out with rubber cup and pumice slurry for all teeth. Teeth samples were mounted horizontally on acrylic resin block by using a rectangular mould made of aluminium (5×2×2cm) into which self cure acrylic was mixed, followed by the teeth samples at right angle to its long axis. Occlusal enamel of teeth was removed perpendicular to the long axis of each tooth to expose a flat dentin surface at a depth of 1.5 mm, using slow-speed diamond disc with water coolant. For the composite buildup, a Teflon mould measuring 2 mm in diameter and 3 mm in height was used to build the composite resin cylinder on the dentinal surface in a two-layer increment technique. For Groups 1 and 2, Filtek P90 self-etch primer was applied and left undisturbed for 15 s. It was air blown for 5 s and light cured for 10 s. Filtek P90 Bond was applied, air blown, and light cured using QTH and LED unit for 10 s each. Filtek P90 was placed in increments in the Teflon mould and cured for 40 and 20 s respectively. For Groups 3 and 4, tooth surface was etched first with 35% phosphoric acid for 15 s, rinsed for 10 s and gently dried with cotton pellet. This was followed by application of two consecutive coats of Adper Singlebond 2 Total Etch adhesive, dried with a gentle stream of air for 5 s, and light-cured using QTH and LED unit for 10 s each. Filtek Z100 was placed in increments in the Teflon mould and cured for 40 and 20 s respectively. The specimens were stored in distilled water for 24 h at 37°C in humidor. Specimens were then subjected to shear bond strength testing using Instrom Universal testing machine at a crosshead speed of 1 mm per minute using a blade parallel to the adhesive interface between the adhesive and dentin. Values obtained were calculated in Mega Pascal (MPa) peak load at failure divided by the specimen surface area. The data was subjected to one-way analysis of variance (ANOVA) using SPSS software (Version 11.0). The multiple range test by Tukey's HSD procedure was employed to identify the significance at 5% level if the P-value by one-way ANOVA was significant. [Table 2] summarizes the mean shear bond strengths of all the groups. In the present study, P<0.05 was considered as indicating statistical significance. The statistical analysis revealed that there is no significant difference among the shear bond strengths between Groups 3 and 4 (P=1.000). Hence, type of light curing unit is not a significant factor affecting shear bond strength for Z100 resin-based composite using the total-etch technique. In contrast, the shear bond strength of Group 3 is significantly higher than that of Groups 1 and 2 (P=0.000 for both). Similarly, the bond strength of Group 4 is significantly higher than both Groups 1 and 2 (P=0.000 for both), thus summarizing that total-etch system gives higher shear bond strength values than self-etch system. The bond strengths for P90 resin-based composites when cured with LED curing unit (Group 2) was significantly lower than when cured with QTH curing unit (Group 1) (P=0.004). The main objective of the bond strength tests is to determine bonding of an adhesive system to the dental hard tissues. One of the commonly used methods to test this adhesion is the shear bond strength testing. ,, In vitro shear bond strengths are useful and essential for predicting the performance of new adhesive systems in comparison to conventional bonding systems. Total-etch and self-etch bonding systems along with two different curing units were compared for shear bond strength values in the present study. Self-etching priming systems combine etching and priming steps, where the primer is air dried. This results in calcium and phosphate ions being solubilized from apatite crystals, which are suspended in alcohol and water solvents in the primer. When these volatile solvents are evaporated, the concentration of calcium and phosphate may exceed the solubility product constants for calcium phosphate, resulting in its precipitation within the primer. This limits ability of adhesives to penetrate the primed surface, leading to lower bond strength values. On the other hand, there are studies which show that few self-etching systems can give bond strengths comparable to the total-etch technique. , These variations may be attributed to the type of bonding agent used. Other factors which may influence in vitro bond strength to dentin are the type and age of the teeth, the degree of dentin demineralization, the dentin surface being bonded, the type of bond strength test (shear or tensile), the storage media, and the environmental relative humidity,  which are not tested in the present study. It has been shown that different light sources influence restoration bond strength. In the present study, for the methacrylate RBC when used with total-etch adhesive system, there was no significant difference in the shear bond strengths between QTH and LED curing units. Amaral CM et al also found no significant difference in bond strengths using QTH and LED units. Korkmaz Y and Attar N also reported no significant difference in shear bond strength using self-etch adhesives, when cured with either QTH or LED units. The LED unit reduces curing time, which can be considered as an advantage. The generation of radical species for methacrylate curing is produced by camphoroquinone, which decomposes immediately due to exposure of light with a wavelength between 410 and 500 nm to start the polymerization process. QTH and LED units used in this study, with a similar intensity, readily activated the photoinitiator with no significant differences in bond strengths. In a contrasting study, Carvalho et al showed that for total-etch adhesives, polymerization with halogen light gave a higher bond strength value than those obtained with polymerization with LED. D'Alpino et al also reported similar results  and attributed it to the lower degree of polymerization with the LED unit used in their study. Within the limits of this study, it can be concluded that total-etch system gave higher shear bond strength values than self-etch system. Type of light curing unit is not a significant factor affecting shear bond strength for methacrylate-based RBCs using total-etch technique. Based on the present results, it can be recommended to use conventional halogen curing units for curing the newly introduced silorane based resin composites. However, this in vitro study needs further in vivo implementation, since factors like pulpal pressure, dentinal fluid may affect dentin bonding. Long-term clinical studies are required to evaluate the efficacy and durability of these bonding agents. 1. Malhotra N, Kundabala M, Shashirashmi A. Strategies to overcome polymerization shrinkage- materials and techniques. A review. Dent Update 2010;37:115-8. 2. Weinmann W, Thalacker C, Rainer Guggenberger. Siloranes in dental composites. Dent Mater 2005;21:68-74. 3. Ilie N, Hickel R. Silorane-based dental composite: Behavior and abilities. Dent Mater 2006;25:445-54. 4. Al-Boni R, Raja OM. Microleakage evaluation of silorane based composites versus methacrylate based composite. J Conserv Dent 2010;13:152-5. 5. Ceballos L, Camejo DG, Fuentes MV, Osorio R, Toledano M, Carvalho RM, et al. Microtensile bond strength of total-etch and self-etching adhesives to caries-affected dentine. J Dent 2003;31:469-77. 6. Mandava D, Ajitha P, Lakshminarayan L. Comparative evaluation of tensile bond strengths of total-etch adhesives and self-etch adhesives with single and multiple consecutive applications: An in vitro study. J Cons Dent 2009;12:55-9. 7. Naughton WT, Latta MA. Bond strength of composite to dentin using self-etching adhesive systems. Quint Int 2005;36:259-62. 8. Lopes GC, Marson FC, Vieira LC, de Caldeira AM, Baratieri LN. Composite bond strength to enamel with self-etching primers Oper Dent 2004;29:424-9. 9. Villela-Rosa AC, Goncalves M, Orsi IA, Miani PK. Shear bond strength of self-etch and total-etch bonding systems at different dentin depths. Braz Oral Res 2011;25:109-15. 10. Reis A, Zander-Grande C, Kossatz S, Stanislawczuk R, Manso A, Carvalho RM, et al. Effect of mode of application on the microtensile bond strength of a self-etch and etch-and-rinse adhesive system. Oper Dent 2010;35:428-35. 11. Korkmaz Y, Attar N. Dentin bond strengths of composites with self-etching adhesives using LED curing lights. J Contemp Dent Pract 2007;8:34-42. 12. D'Alpino PH, Wang L, Rueggeberg FA, Svizero NR, Pereira JC, Pashley DH, et al. Bond strength of resin-based restorations polymerized with different light-curing sources. J Adhes Dent 2006;8:293-8. 13. Amaral CM, Peris AR, Ambrosano GM, Swift EJ Jr, Pimenta LA. The effect of light-curing source and mode on microtensile bond strength to bovine dentin. J Adhes Dent 2006;8:41-5. 14. Sensi LG, Lopes GC, Monteiro S Jr, Baratieri LN, Vieira LC. Dentin bond strength of self-etching primers/adhesives. Oper Dent 2005;30:63-8. 15. Carvalho MC, Turbino ML. Analysis of the microtensile bond strength to enamel of two adhesive systems polymerized by halogen light or LED. Braz Oral Res 2005;19:307-11. 16. Erickson RL, Barkmeier WW, Latta MA. 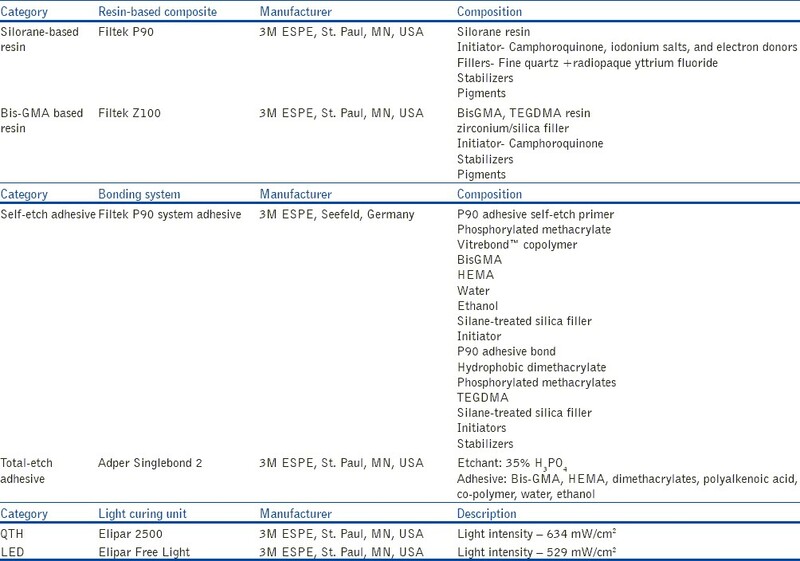 The role of etching in bonding to enamel: A comparison of self-etching and etch-and-rinse adhesive systems. Dent Mater 2009;25:1459-67. 17. Neelima L, Sathish ES, Kandaswamy D, Bupesh. Evaluation of microtensile bond strength of total-etch, self-etch and glass ionomer adhesive to human dentin: An invitro study. Indian J Dent Res 2008;19:129-33. 18. Jose C, Perdiago J. Bond strength and SEM morphology of dentin amalgam adhesives. Am J Dent 1997;10:152-8. 19. Guiraldo RD, Consani S, Consani RL, Berger SB, Mendes WB, Sinhoreti MA, et al. Comparison of Silorane and Methacrylate-Based Composite Resins on the Curing Light Transmission. Braz Dent J 2010;21:538-42. 20. Kusgoz A, Ulker M, Yesilyurt C, Yoldas OH, Ozil M, Tanriver M. Silorane-Based Composite: Depth of Cure, Surface Hardness, Degree of Conversion, and Cervical Microleakage in Class II Cavities. J Esthet Rest Dent 2011;23:324-35. 21. Kim JS, Choi YH, Cho BH, Son HH, Lee IB, Um CM, et al. Effect of light-cure time of adhesive resin on the thickness of the oxygen-inhibited layer and the microtensile bond strength to dentin. J Biomed Mater Res B Appl Biomater 2006;78:115-23. 22. Shortall AC, Wilson HJ, Harrington E. Depth of cure of radiation activated composite restoratives influence of shade and opacity. J Oral Rehabil 1995;22:337-42. 23. Miyazaki M, Hinoura K, Onose H, Moore BK. Effect of filler content of light-cured composites on bond strength to bovine dentine. J Dent 1991;19:301-3. 24. Hofmann N, Hugo B, Klaiber B. Effect of irradiation type (LED or QTH) on photo-activated composite shrinkage strain kinetics, temperature rise, and hardness. Eur J Oral Sci 2002;110:471-9. 25. Lovell LG, Lu H, Elliott JE, Stansbury JW, Bowman CN. The effect of cure rate on the mechanical properties of dental resins. Dent Mater 2001;17:504-11.